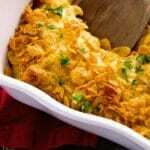 Cheesy Hash Brown Chicken Casserole ~ Your Favorite Cheesy Hash Brown Casserole In a Main Dish! 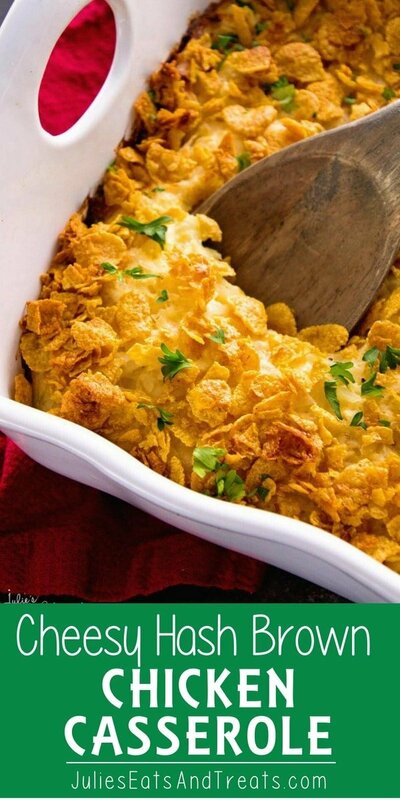 Comforting Casserole Loaded with Hash Browns, Cheese, and Chicken Perfect for Dinner! We have been battling sickness over here at my house and I’m guessing I’m not the only saying this! ‘Tis the season after the holidays where we all got together, had a wonderful time and shared everything including sickness. Due to this I’ve been making sure we have easy meals that are comforting at my house. There’s nothing I want more when I’m sick! Plus, easy because this Mom is feeling crappy like everyone else! There’s been a lot of Oven Baked Scrambled Eggs, Slow Cooker Tomato Basil Soup, Green Beans, Chicken and Potatoes and Cheesy Chicken Stuffing Casserole! Somehow my husband has skipped being sick? We’ve decided it’s because he’s hardly been around due to snow plowing and ice fishing. I’d probably avoid being home to after listening to us cough! One thing I’ve been soaking up is snuggles. My girls aren’t real big snugglers usually so when they don’t feel good and want to snuggle up to Mom I usually savor every moment of it! Are your kids snuggly? My Mom always used to tell me I was a cold fish and never would snuggle with her so I guess it’s pay back for that! One thing I try to do when we are sick is make sure our fridge is stocked with “easy staples” so I can make a dinner without much effort because the kids are needy and I’m trying to focus on them instead of a 5 course meal, wait I never make a five course meal! Simple, Easy and Wholesome is more my style! One thing that is always stocked in my fridge is Simply Potatoes. Whether it’s their fabulous mashed potatoes, hash browns or diced potatoes they make my meal times way simpler. Plus, I love that they are fresh and never frozen potatoes and made with real ingredients! I can either throw them in my favorite recipe or serve them up as a side dish. Either way it’s a win for this Mom! 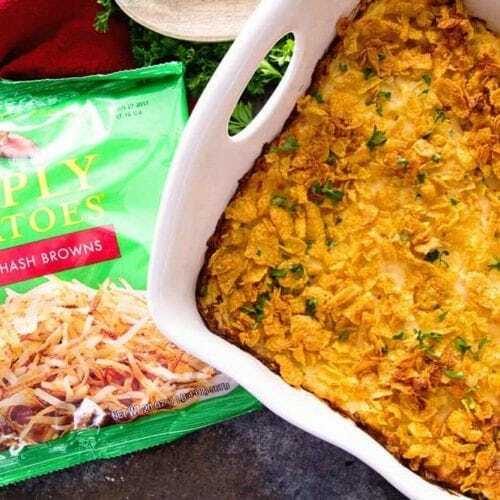 For this delicious Cheesy Hash Brown Chicken Casserole I dressed up our favorite side dish, Cheesy Hash Browns and made it into a main dish casserole using Simply Potatoes! It’s great for weeknight meals when you are in a hurry because it comes together quickly and you can also prep it the night before, so you can just bake it the next day! I’m all about prepping meals the night before so when I’m in a rush I know I can still serve up a meal for my family! Plus my friends at Simply Potatoes are giving away a Lodge Cast Iron Skillet to one of you! Make sure to enter below and you could use it to make our favorite breakfast, lunch or dinner Cheesy Bacon Egg Hash Brown Skillet! 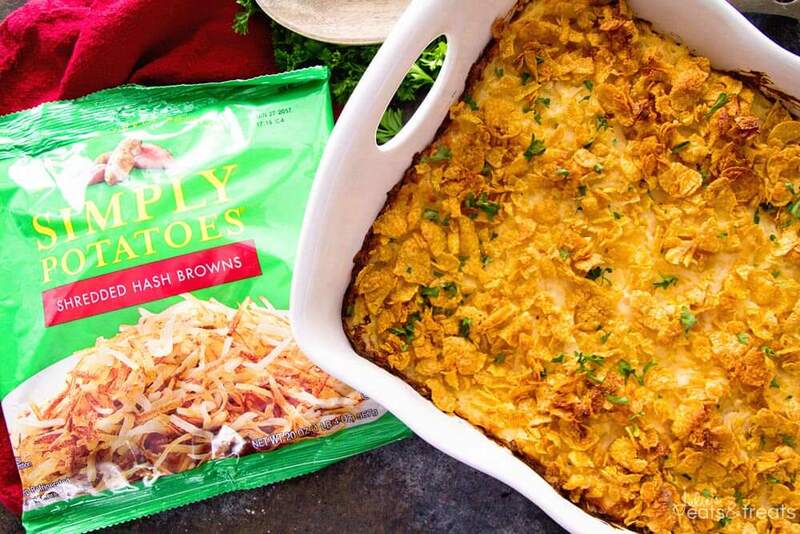 Your Favorite Cheesy Hash Brown Casserole In a Main Dish! Comforting Casserole Loaded with Hash Browns, Cheese, and Chicken Perfect for Dinner! Preheat oven to 400 degrees. In a large bowl mix together hash browns, cheese, salt, pepper, sour cream, cream of chicken soup, milk, and chicken. Place in the bottom of a lightly greased 9x13'' pan. 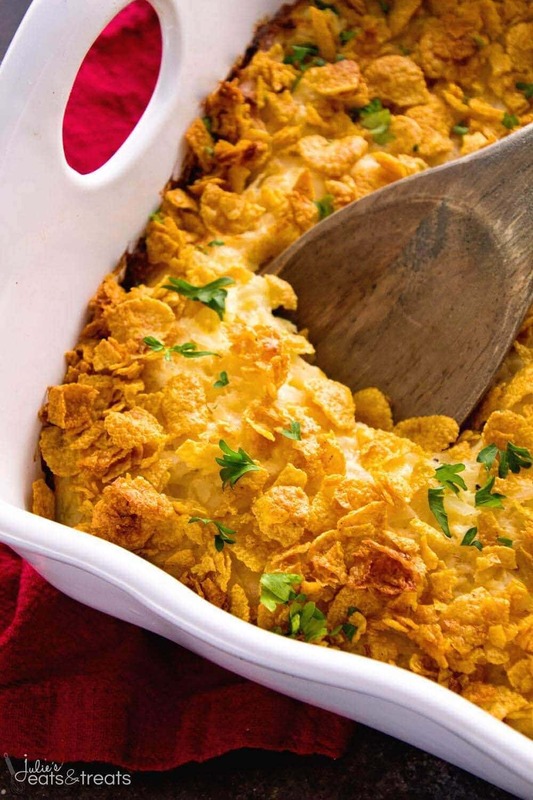 In a small mixing bowl mix together corn flakes and butter. Sprinkle over hash brown mixture. Bake for 1 hour or until top is golden brown. This is a sponsored conversation written by me on behalf of Simply Potatoes®. The opinions and text are all mine. 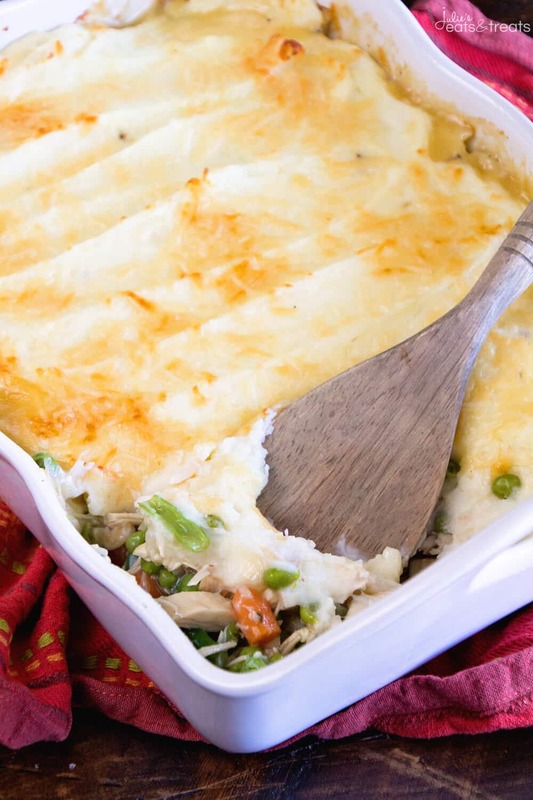 Turkey Shepherd’s Pie ~ The Perfect Casserole to use up Leftover Turkey and Vegetables from the Holidays! Peas, Carrots and Beans with Gravy then Piled with Mashed Potatoes and Topped with Parmesan Cheese! 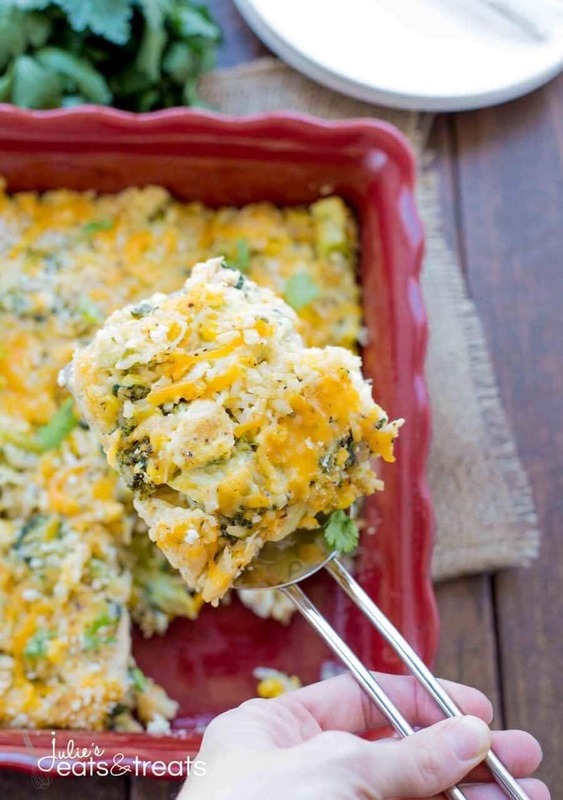 Vegetable and Cheesy Chicken Rice Casserole Recipe ~ Easy, no fuss casserole for dinner! Loaded with all sorts of Delicious Ingredients and the Leftovers are even better the next day. Cheesy Chicken Stuffing Casserole ~ Tender, Juicy Chicken Breast Topped with Cheese and Stuffing! Quick, Easy Weeknight Recipe! Great thing to win and to cook with. Love this site. Cannot wait to try the Chicken Hash Brown recipe. I would love to win this!!! I think the Chicken Hash Brown recipe looks wonderful. I need to get out and get the ingredients. I would love to use this to make some friend potatoes with diced ham onions and green peppers. Made this for my family tonight, everyone went up for three helpings! It was wonderful! The only thing I would personally do next time is add more chicken and more cheese. Being from Wisconsin, it’s always all about the cheese! Thank you for sharing this recipe, we will be making it again!! What can I use in place of the cornflakes? Thanks! Is the hash browns thawed or frozen when you mix it all together? This recipe calls for REFRIGERATED hash browns, therefore they would be thawed. YAY! Glad you found a keeper! Where is the recipe though? Do I have to watch the video and write down the steps? Hi Pam! Sorry we were having some technical difficulties everything should be resolved! Hi Casey! Sorry we were having some technical difficulties everything should be resolved! 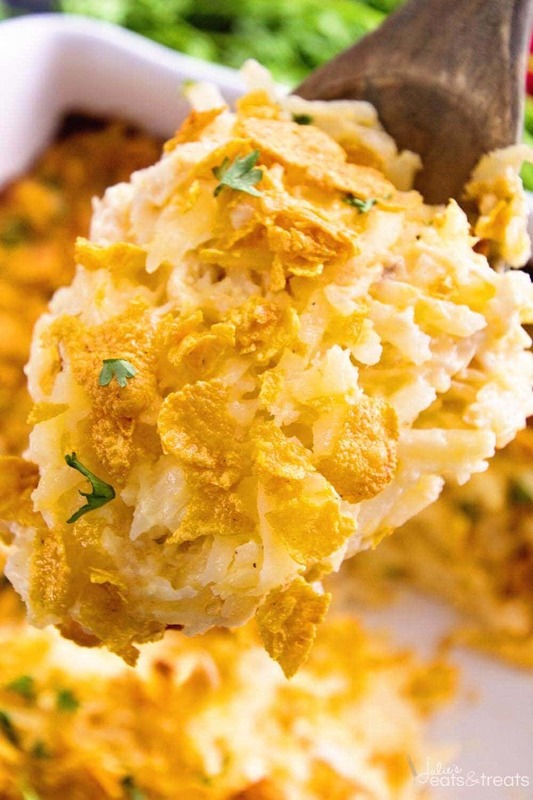 This hash brown casserole is delish! It is a keeper. My daughter and I made this last night. It was really good. I used a rotisserie chicken which added a little extra flavor. I would recommend that the cooking time be reduced, or that the temperature be lowered. Luckily I had set my timer for 45 minutes because 1 hour at 400 seemed like a lot for a casserole. The top was already a little burned. I’m going to make this for the rest of my family next week and see what they think. I tried making a recipe similar before and it was so dry. This one was perfect!!! I cooked my chicken in my instapot then shredded it and put it all together! I only had to bake mine for 30-35 minutes though.